FBC Insurance Company Limited, a subsidiary of the diversified financial services group, FBC Holdings has launched a world-class, customer-driven and low-cost Usage Based Insurance product christened My Drive. 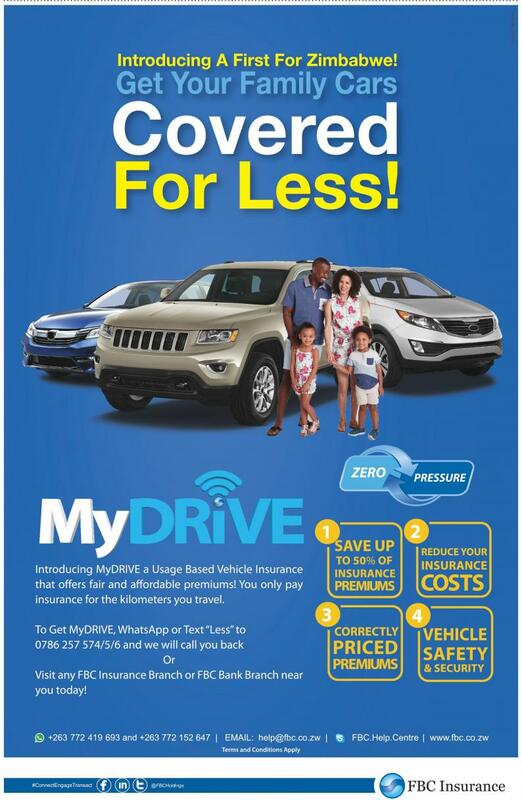 MyDrive, which is a first of its kind in Zimbabwe, allows clients to enjoy cost savings hinged on customised and fair insurance premium charges based on the customer's actual annual mileage. The solution provides customised comprehensive insurance cover which allows customers to save up to 50% on their vehicle insurance premiums in line with kilometres covered. The product is available for individuals, corporates, schools and churches. MyDRIVE by FBC Insurance is now available on the market. Clients interested in signing up for the affordable service can text "Less" to 0786257574/5/6 and an FBC representative will call back or visit their nearest FBC Insurance or FBC Bank branch countrywide for assistance. Commenting on the new development, Roy Nyakunuwa (FBC Holdings Brand Manager) said, "The pricing scheme for the world-class and affordable FBC Insurance MyDRIVE Usage Based Insurance deviates greatly from that of traditional motor insurance. It provides a wide spectrum of client segments the freedom to enjoy fair and affordable insurance pricing." He continued: "What we have observed is that in some instances people own more than one vehicle and some of the vehicles are not often used and are mostly parked at home. When it comes to payment of insurance, the parked vehicles attract premiums equivalent to those of vehicles that are for everyday use. Some drivers stay very close to their workplaces and they do not do much mileage and in such cases, it becomes prudent to get insurance in line with the mileage they cover. This customised insurance solution is designed to provide fair and affordable insurance solutions to the motoring public." FBC Insurance Company (formerly known as Eagle Insurance) aims to be a market leader in creating stakeholder value in the Zimbabwean insurance industry and providing world-class insurance solutions that meet the needs of its customers. FBC Insurance is the local insurer of the future, having fully embraced world-class technology and digitalisation in its operations.